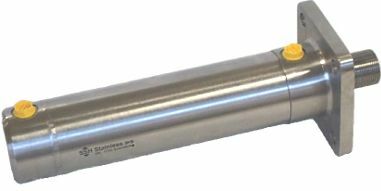 AQ70 VZ stainless steel hydraulic cylinder. Please enter How to order for ordering and for opening the dimension table for all the cylinders. For dimension sketch in PDF, please select the specific cylinder dimension. AQ70 LL stainless steel hydraulic cylinder. AQ70 NN stainless steel hydraulic cylinder. AQ70 FD and FP stainless steel hydraulic cylinder.